Arugula is a spicy green, and not my favorite. I like to substitute baby spinach leaves in this salad. Fit this 239 calorie filling salad into your low calorie meal plan. Toss asparagus with 2 teaspoons oil and 1/4 teaspoon each salt and pepper in a large bowl. Transfer to a large rimmed baking sheet. Roast, stirring once, until very tender, 15 to 20 minutes. Meanwhile, whisk the remaining 2 tablespoons plus 1 teaspoon oil, the remaining 1/4 teaspoon each salt and pepper, lemon zest, lemon juice, shallot and dry mustard in the bowl. Set aside 4 teaspoons of the dressing in a small bowl. 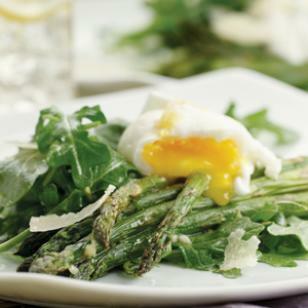 # When the asparagus is done, set aside to cool while you poach the eggs. When the asparagus is done, set aside to cool while you poach the eggs. Break each egg into its own small bowl. Fill a large, straight-sided skillet or Dutch oven with 2 inches of water; bring to a boil. Add vinegar. Reduce to a gentle simmer: the water should be steaming and small bubbles should come up from the bottom of the pan. Submerging the lip of each bowl into the simmering water, gently add the eggs, one at a time. Cook 4 minutes for soft set, 5 minutes for medium set and 8 minutes for hard set. Using a slotted spoon, transfer the eggs to a clean kitchen towel to drain for a minute. Toss arugula with the dressing in the large bowl. Divide the salad among 4 plates. Top with asparagus and a poached egg and drizzle with 1 teaspoon of the reserved dressing. Garnish with cheese. Make Ahead Tip: Cover and refrigerate the dressing (Step 3) for up to 1 day. Tip: To make shaved cheese for topping salads or pasta, use a vegetable peeler to thinly shave slices off a block of hard cheese, such as Parmigiano-Reggiano, Asiago or Pecorino Romano.